Across the country, soldiers, sailors, and pilots continue to return from two, three, or four tours of duty in dangerous combat zones. For those who have been away from home for such long time stretches of time, finding work and a sense of purpose in their communities brings a whole new set of challenges. For a number of returning veterans, however, craft beer has provided a source of inspiration and income. It’s also allowed them to draw on skills and experience gained in the military: working as a unit, troubleshooting repairs, navigating governmental red tape, understanding systems operations, efficiently managing people and inventory. Perhaps in some small way, this community has helped these individuals assimilate back into civilian life, too. As a rule, soldiers don’t tend to shy away from adversity. On the contrary, the ability to handle hardship and misfortune is just another facet of a demanding job for these men and women. After serving on a post, airfield or Navy vessel though, many members of the armed forces might look forward to an occupation with lower stress levels, shorter hours and perhaps a smaller degree of personal risk. More than a few probably wouldn’t mind a cold beer at the end of the workday, either. But the transition back to civilian life after months or years spent abroad in Iraq, Afghanistan or elsewhere isn’t without its difficulties, and large numbers of recent veterans struggle to find work. In 2012, the nonprofit organization Iraq and Afghanistan Veterans of America (IAVA) reported that the majority of returning service members say finding a job is the biggest hurdle during their transition period. Some of those who are fortunate enough to receive placement assistance also find their skills underused and their job satisfaction minimal. Others, though, are determined to blaze their own trail. From Vermont to Connecticut and Colorado to Maryland, veteran-owned breweries such as 14th Star, Cavalry, Red Leg and Full Tilt have popped up in the last few years, joining more established veteran-owned breweries like Top of the Hill Restaurant and Brewery and Railhouse Brewery in North Carolina and Bayou Teche Brewing in Louisiana. Encouraged by the demand for craft beer, equipped with transferable experience, and willing to confront problems head on, these former service members are working hard to gain a footing in a new industry after holding down stressful jobs that put them in harm’s way. And these newcomers aren’t alone. Other vets aspire to join America’s brewing renaissance as well: Bravo Zulu, CasaNoVa, Young Veterans and Ryan’s Service Brewing are four more examples of companies that have recently entered the market or are poised to do so in the months ahead. But what does the future hold for these soldier-brewers? Will they successfully turn their swords into mash paddles? 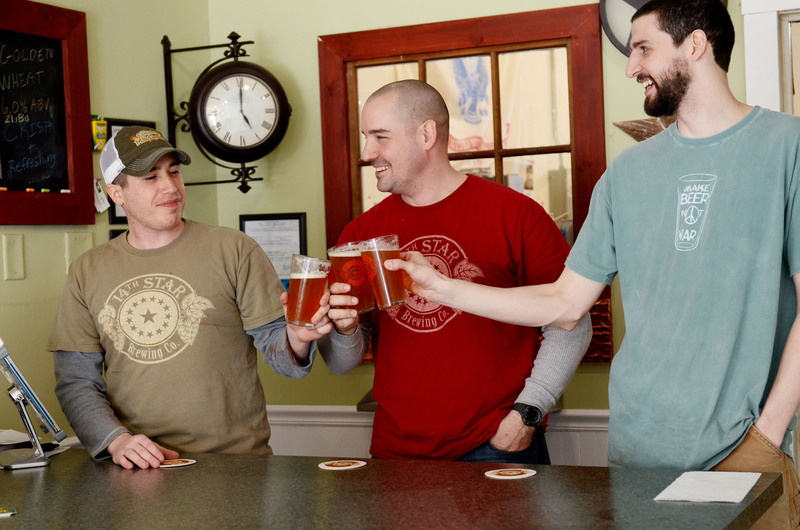 Steve Gagner, the self-assured owner and head brewer at Vermont’s 14th Star, thinks he can. After homebrewing for roughly seven years, he started toying around with the idea of a brewery, sketching out a business plan during his down time while on a tour of duty in Afghanistan. Back in the States, he took a conservative approach, opting to build rather than buy most of the equipment that would end up in his brewhouse. Advice, goodwill and the loan of fermentation space and a conditioning tank also went a long way. So far his modest plan is paying off—business has been brisk and he’s already seriously thinking about the next phase. Looking to the future of 14th Star, though, he doesn’t wax too philosophical, preferring a straightforward modus operandi for his 3.5-barrel company in St. Albans, in northwestern Vermont. It didn’t take long for Gagner to notice that the one-barrel system he started on simply wasn’t keeping up with demand. But with a family to take care of and no track record in the beer industry, he proceeded with caution, resisting the urge to scale up suddenly and dramatically. Since launching with the assistance of friend and fellow vet Matt Kehaya, he has nonetheless ramped up production in the cramped space next to a transmission shop. And, as might be expected from a pair of guys who spent the better part of two decades building and fixing things in the Army, they repurposed or fabricated themselves nearly every piece of equipment in their brewhouse. Debuting at the 2012 Vermont Brewers Festival with a pale ale, 14th Star has steadily added to its range and now produces Harvest Brown Ale, Honey IPA, Golden Wheat, 1493 (another pale ale brewed with coriander seed and citrus zest), an amber ale called Valor, a roasted porter, a winter warmer and most recently, a double IPA whenever they “get the itch to brew them.” Midway through the year, the small company also introduced a Maple City series, named for their base of operations, that includes Maple Porter, Maple IPA and Maple Wheat, all three of which were enthusiastically received by local beer connoisseurs. And this was after a mere four hours of weekday sales in their tiny taproom. The addition of another full-time brewer—Dan Sartwell—has helped, but the three-man team often finds itself running to stand still. This spring, less than a year into its existence, 14th Star also began bottling, a shrewd move that will widen the brewery’s audience even as it further taxes production capacity. In other words, precisely the type of problem an ambitious new business owner wants to have. Five hundred miles south at Full Tilt Brewing, a contract operation based in Baltimore, Nick Fertig has also experienced some of the same frenzy for a limited but growing lineup of beers. In fact, Fertig, a U.S. Navy veteran who co-owns the company with his cousin Dan Baumiller, still seems surprised when asked to reflect on his first year in the beer industry. Since their launch on Dec. 29, 2012, the two have endured a hectic period of hops contracts negotiations, label approval setbacks, unexpected costs and a drinking public that wanted one thing and one thing only: more Full Tilt beer, thank you very much. Unlike other brewery start-ups, both men kept their full-time jobs as they worked to turn Full Tilt into a reality, Baumiller at the Department of Defense on the civilian side and Fertig at Brandon Shores Generating Station, a coal-fired power plant in Curtis Bay. Before that, Fertig served in the Navy for six years, two at Naval Station Norfolk in Virginia, and another four aboard the USS Jacksonville, a nuclear-powered attack submarine. Starting with a homebrew kit purchased for $100 on eBay, the pair soon got serious about their hobby, brewing every weekend for a full year. Quickly graduating from extract brewing to all-grain, they began hosting beer-tasting parties, inviting friends to try their hoppy creations. But when they decided to turn professional four years later, the two cousins had to admit that they didn’t exactly know what they were doing. And while they believed in their recipes and saw opportunity in Baltimore, a large outlay of cash wasn’t really an option for two guys in their late 20s. Fortunately, though, “Charm City” Baltimore had a solution to their problems. Once they design a recipe, brew it on Ethel, a 10-gallon system that Fertig built five years ago, and test it extensively, they put their concepts in the capable hands of brewer Ernie Igot, formerly of Baltimore’s Heavy Seas. Today Igot is the head brewer at the Peabody Heights Brewery, a relatively new 30-barrel operation not far from Johns Hopkins University and the Baltimore Museum of Art. Full Tilt’s two current beers, Baltimore Pale Ale and Fleet Street Raspberry Wheat (to be joined in the near future by a chocolate stout or an imperial pumpkin) are produced here alongside ales and lagers from Raven Beer and Public Works, two other area contract brewers. Then it’s up to the young business partners to manage their inventory, market their brand and add customers in an increasingly competitive environment. Long hours on nights and weekends are commonplace. They also occasionally find themselves defending their business model. In Fertig’s view, he and Baumiller aren’t any less invested or passionate than a company with its own brewhouse. He asserts that they aspire to own a brewery eventually, but knew that failure was a possibility and made the choice to start their company with less money. Meanwhile, until they find a suitable brewery location in the metro area, they plan to concentrate on introducing new beers and increasing their involvement in the local scene with events, tastings and promotions. Maybe by year two Full Tilt will have grown enough to support a full-time employee. “The first milestone will be when one of us quits our job,” Fertig says optimistically. Todd Baldwin, Founder and President of Colorado’s Red Leg Brewing, is also familiar with the amount of effort involved in launching a beer company. Working with assistant brewer Michael Acerra and brewmaster Jeff Lockhart, a former U.S. Army helicopter mechanic with 15 years of experience at Sweetwater, Ouray and Shamrock Brewing, Baldwin opened his Colorado Springs tasting room to an eager crowd of 250 people on Independence Day this year. And although Red Leg is starting off somewhat over budget and several months behind schedule, Baldwin remains positive about his new venture. As he began to think more seriously about pursuing a career in beer, Baldwin made sure that veterans were part of his business plan. He would hire vets, give back to organizations like Operation Homefront that offer assistance to service members and acknowledge different military units with limited releases like Screaming Eagle, a yet-to-be-determined beer he plans to name after the 101st Airborne Division. Even the name Red Leg is a tribute to the armed forces and Baldwin’s former occupation. During the Mexican-American War in the mid-19th century, the U.S. Army’s Field Artillery Corps came to be known as “red legs” due to the thick red stripe on the pants of their uniforms. So by choosing this military nickname to represent his brewery, Baldwin ended up with something meaningful on both a personal and a public level. When asked about his dedication to veterans and his goals for Red Leg, he has a succinct yet sincere reply. Brewing is the immediate objective, however, and Red Leg now offers five year-round beers along with one rotating selection. But here again, Baldwin and his team maintain a clear sense of identity. Each of the five annual releases takes inspiration from a different branch of the military: Sergeant Pils is a nod to the Army, Cutter Wit is named with the Coast Guard in mind, Blue Nose Brown honors the Navy, Devil Dog Stout is a beer fit for the Marines, and Do-Little IPA acknowledges the famed Air Force commanding Gen. James Doolittle. A red and blue color scheme and a geometric camouflage design on one wall of the tasting room take the theme even further. With Fort Carson, the Peterson and Schriever Air Force Bases, and the Air Force Academy all in or around Colorado Springs, Baldwin should be confident about the future of Red Leg. Even with the abundance of breweries vying for beer drinkers across Colorado, his brand has potential. Baldwin doesn’t consider failure an option. Mike McCreary has a similar attitude. “The only opportunity is the one I create myself,” declares the 55-year-old former civil affairs officer. As the owner and head brewer of Connecticut’s Cavalry Brewing, he speaks from experience. In 2008, McCreary, who had previously served as an Army reservist for close to 23 years, including a tour of duty in Baghdad in 2003, suddenly found himself jobless. With the country slipping into a prolonged recession, his employer, an analytical instrumentation company, decided to shut down the division he had been running. And so, armed with professional experience in sales and marketing, an educational background in biochemistry and a fondness for well-balanced sessionable beers, he got on a plane and went to Brewlab in Sunderland, England, to learn the ins and outs of English ales. “I always thought they had the best beer in the world,” he says, explaining his decision to travel to the U.K. to study the craft of brewing. Upon returning to the U.S., he found a receptive business environment in Oxford, CT, and opened his 15-barrel brewery in this town of some 12,000 people. And just like dozens of brewers before, he resolved to make the beers he wanted to drink, traditional English ales brewed with English malts, hops and yeasts. Then he named his first four products—Dog Soldier Golden Ale, Hatch Plug Ale, Big Wally Porter, and Nomad Stout—after friends he served with in Iraq. In the years since launching his brewery, McCreary has found the military angle to be a strong selling point. It’s also a chance to maintain a connection with a consequential period of his life. McCreary has since added X-Limited Edition Ale, Article 15 Ale, an English-style brown, and Marauder IPA to the Cavalry lineup and is now cask conditioning some of his beers, too. He also understands that a quality product alone isn’t enough to ensure long-term success, and he knows the bonhomie that greeted him in his first few years of business won’t last forever. As newcomers from coast to coast continue to gravitate to the beer industry, those that can distinguish themselves with a strong brand and careful marketing stand the best chance of becoming veterans of a different kind: seasoned brewers. It won’t be easy, but a little determination goes a long way. Kevin Ryan and Dan Sartin of Service Brewing Co.
Kevin Ryan won’t officially deploy his first two Service Brewing beers—Ground Pounder Pale Ale and Compass Rose IPA—until November, but he’s already given careful consideration to his location, his products and his message. 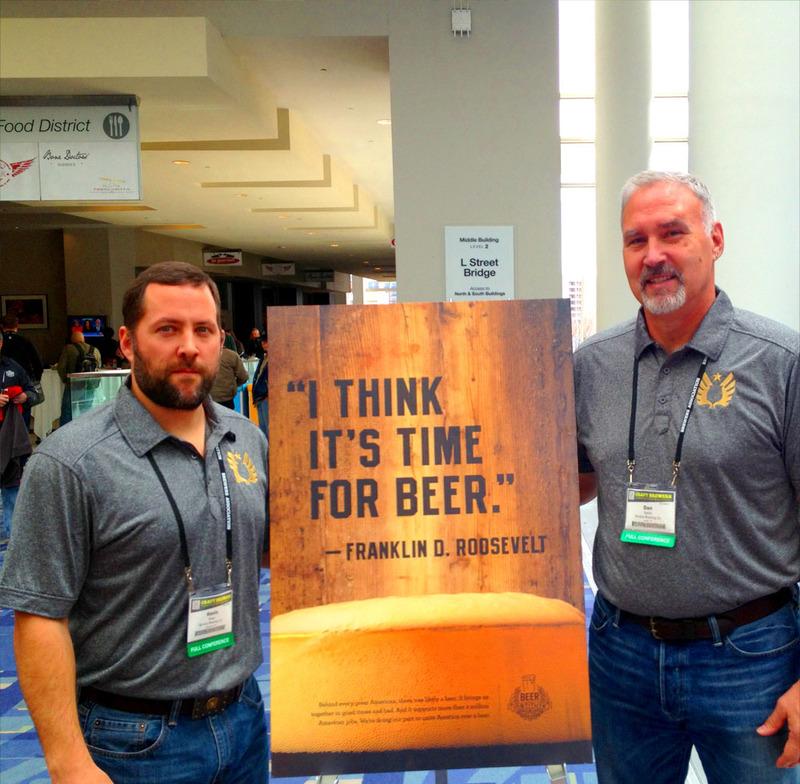 Like a number of other veteran-owned breweries, Service is about more than beer alone. Part of his plan includes giving a portion of the brewery’s profits to service-oriented charities such as Operation Homefront and the Two Hundred Club of the Coastal Empire, an organization that provides financial assistance to the family members of police officers and firefighters who lose their lives in the line of duty. Ben Keene is a beer journalist and travel writer. In December, Voyageur Press will release his third book, The Great Northeast Brewery Tour. I’m a veteran of the USAF, a home brewer, beer judge and craft beer enthusiast. I loved reading this story and I wish these brewers great success and look forward to the opportunity to sample their wares in the future. Thank you for your service and God speed. I’m glad you enjoyed the piece, Ken. Young Veterans in Virginia and Frey’s in Maryland are up and running and I’m sure there are other vet-owned breweries in the Midwest that are soon to be or already in operation.